Will Compassion Be Missing From the Story of Your Life? Register Now to hold your spot and save $50! Early bird ends June 1st! WHAT HAS HAPPENED TO COMPASSION? A young man killing a young woman by using his car to run down a crowd protesting against bigotry and injustice. A pastor shutting his church doors and turning away people needing shelter after the destruction of Hurricane Harvey. Do we still believe in compassion, basic goodness, optimism, over all care, health and well-being of our communities? Does this leave you wondering like me, what in the world has happened to compassion? DO YOU WANT TO CONTINUE DOWN THIS PATH AND GO DOWN LIKE THAT? OR WOULD YOU LIKE TO HELP AND MAKE LASTING CHANGE IN THE STATE OF OUR WORLD? Compassion training is a skill that needs to be practiced, understood, and applied. It is actually a very complex mental state and our "un-trained" brains can hijack the compassionate process at any moment. CBCT® Cognitive Behavioral Compassion Training can help us rediscover our purpose in life. Do you want to leave a legacy that never once leaves a doubt about how compassionate you were? CBCT® will help you do just that. CBCT® is a structured sequence of meditation exercises designed to strengthen mental stability, deepen awareness and understanding of thoughts and emotions, and support the growth of our inherent capacity to care for others. The aim of the practice is to generate and sustain a robust, inclusive, and warm-hearted responsiveness, while protecting ourselves from the side effects of empathic distress, burn-out, fatigue, secondary trauma and shut-down immobility responses. It restores dynamic equilibrium where we can train in relaxed alertness. From this place of stability and a brain that is in-check, we can extend compassion not only to ourselves but to all others, especially those whom we love and care for. One of these days you and I will no longer be here. When we are gone people are going to talk about us. What do you want them to be able to say about you? How will you ensure they will say, amongst other things, that you were compassionate? That you did your complete best and all that you could to love your neighbors, open your heart and be kind. Be our hope for humanity. Two additional 4 hour retreats on September 9th 2018 11:00a.m. to 3:00p.m. and October 14th, 2018 11:00a.m. to 3:00p.m. are required for CE Credits and optional for all other participants. CBCT® (Cognitively-Based Compassion Training) is a method for cultivating greater well-being through the use of reflective practices. Developed at Emory University in 2004 by Geshe Lobsang Tenzin Negi, PhD, CBCT® is based on centuries-old techniques from the Indo-Tibetan tradition. Negi drew from the lojong tradition, a set of meditative practices designed to bring about ‘thought transformation,’ to create this contemporary and secular method. CBCT® is independent from—and in many ways supportive of—any faith or belief system. 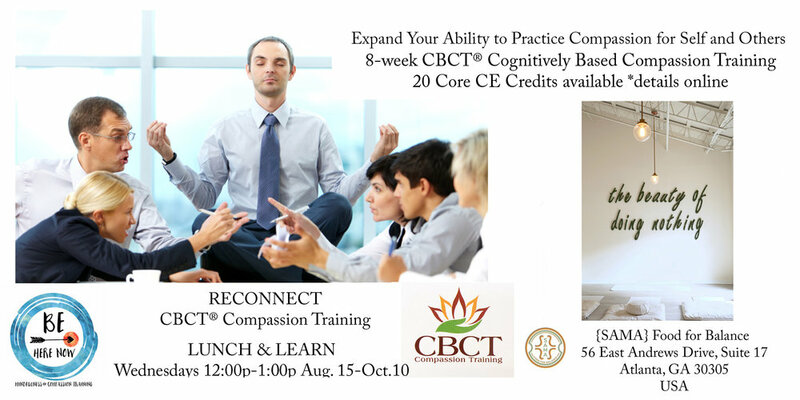 CBCT® (Cognitively-Based Compassion Training®) is a program that deliberately and systematically works to cultivate compassion. Through progressive exercises (beginning with the development of attentional stability and progressing through various analytical meditations), one gains insight into how one's attitudes and behaviors support or hinder compassionate response. The practice of CBCT® intensifies the desire to help others, allowing compassion to become more natural and spontaneous in one's everyday life. It also helps increase personal resiliency by grounding one in realistic expectations of self and others. CBCT® offers tools to expand compassion toward wider and wider circles. The practices support the growth of a number of mental states and behaviors valued across cultures, such as kindness, gratitude, generosity, and warm-heartedness. The fundamental premise is that compassion is a trait that can be developed and expanded. This view is supported by contemporary science as well as by most spiritual traditions. 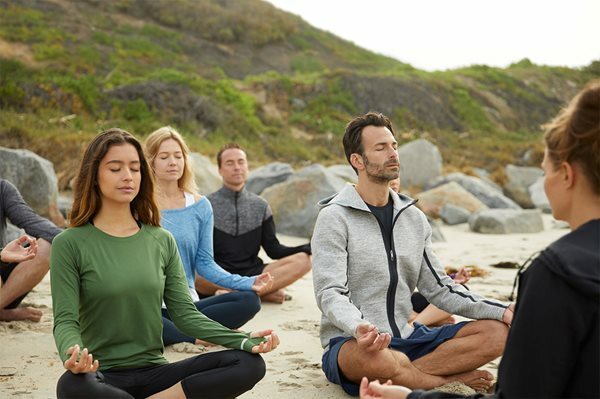 Interest in contemplative practice has burgeoned in recent years as scientists in diverse fields point out the significant role that other-centered behaviors appear to play in health and wellbeing. Primatologist Frans de Waal, for example, posits that the common perception of human nature as a self-centered drive for individual survival is largely distorted, if not altogether wrong. Rather, he suggests, the roots of empathy, compassion, and morality run deep in human evolutionary history. When we focus on ourselves, our world contracts as our problems and preoccupations loom large. But when we focus on others, our world expands. Our own problems drift to the periphery of the mind and so seem smaller, and we increase our capacity for connection - or compassionate action. Further, work in social neuroscience has shown that the perception of social isolation is a risk factor for poor cognitive performance and can lead to an increase in depressive thoughts. Taken together, this research suggests that practices that enhance our sense of connectivity with others—such as CBCT®—may have a positive impact on our physical and mental health. Emerging data from a variety of on-going studies is supporting this supposition. Sally E. Dodds,Thaddeus W.W. Pace, Melanie L. Bell, Mallorie Fiero,Lobsang Tenzin Negi, Charles L. Raison, Karen L. Weihs. Feasibility of Cognitively-Based Compassion Training (CBCT) for breast cancer survivors: a randomized, wait list controlled pilot study Support Care Cancer, 2015 Dec;23(12):3599-608. doi: 10.1007/s00520-015-2888-1. For more on the need for cultivating compassion, watch this video by one of our CBCT® researchers, Dr. Charles Raison. Dr. Charles Raison TEDxAtlanta - "We're Fighting the Wrong Enemy"